Price Range £152 - £170Price RangeSimply drag the slider bar to set your price range. The N40-5 is a restyling of the Nolan N40 which confirms the much-appreciated technical characteristics of the previous model and renews the upper air intake, the peak, the cover plates and the comfortable Clima Comfort inner padding. The large surface of the scratch resistant ultrawide visor gives a broader field of view thus highly increasing safety. 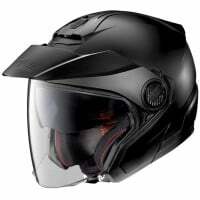 It is also able to protect the rider's face from water and wind whilst at the same time guaranteeing air circulation within the helmet. 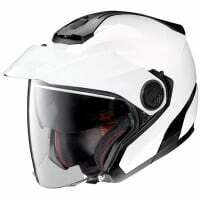 The helmet also boosts a VPS sun visor, AirBooster Technology upper ventilation system, removable peak and set up for the N-Com communication system making the N40-5 an interesting jet style helmet for both the scooter and motorbike riders.